It started three years ago as an idea to expose people to winter outdoor activities they might not have tried. Today, the Jackson Hole Nordic Alliance’s Free Ski, Fat Bike & Snowshoe Day is a beloved community event. Great snow and weather last year drew more than 400 people to the ranch for the event. 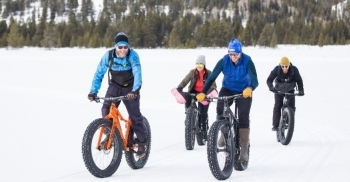 A similar number is expected for the upcoming free day on Jan. 6 as organizers will have more fat bikes, skate skis and classic backcountry skis for people to try. Kids will have more options for playing in the snow and a greater variety of food will keep everyone energized. The Jackson Hole area is world renowned for its downhill and backcountry skiing. 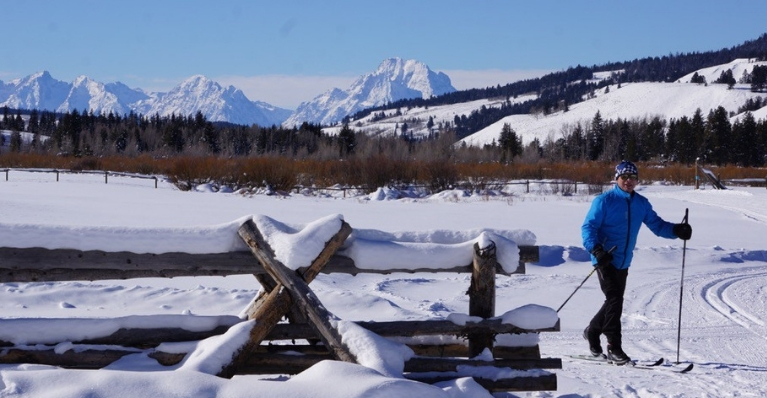 The Jackson Hole Nordic Alliance, a local nonprofit dedicated to skate and classic cross-country skiing as well as fat biking, wanted an event to showcase the outdoor opportunities on the groomed trails that are so abundant in the area. The Jackson Hole Travel and Tourism Board agreed to provide a grant to underwrite promotion of the event. We agreed to be a partner by providing free access to our 15 km of groomed trails. Everyon e is anticipating a large turnout given that this is now the third year and word has spread. Skinny Skis, a local ski shop and event sponsor, intends to bring a wider range of skate and classic cross-country skis. Four bike shops will be bringing more fat bikes than last year. Leon said the goal is to let as many people as possible demo the bikes and skis to encourage increased participation. The local youth ski club will provide a free shuttle from Jackson Hole to the ranch. The goal is to give as many locals and visitors easy access to the event. “The focus is on the local community, but we do get visitors to Jackson Hole who are intrigued and come out,” Leon said. The spotlight on the ranch is a dream for us. Our experienced guides will provide wildlife tours that showcase the ranch’s proximity to Bridger Teton National Park and the Greater Jackson ecosystem.